Not to be confused with World 1-8, Level 1-8, or Stage 1-8. Area 1-8 is the eighth course of Coaster Hills and the eighth course overall in Mario vs. Donkey Kong: Mini-Land Mayhem!. It introduces Minis with keys. 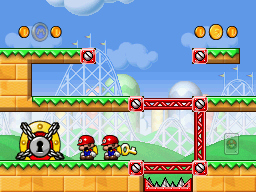 The level features two Mini Marios, including the one with the key. Both Mini Marios begin on the bottom left, right next to the exit door. In order to reach it, both Mini Marios must be lured up onto the upper level, then the Mini Mario with the key lured onto the bottom level and bounded by Red Girder walls in order to wait for the other Mini Mario. If done correctly, the Mini Mario with the key should be able to unlock the exit, the other Mini Mario following soon after. The M-Token is located at the top left. It can simply be collected by drawing Red Girders to lead a Mini Mario to it. The Mini Mario Card is located on the bottom right. It can be collected simply by having a Mini Mario approach it on the bottom level.